While planning our first purpose-built IoT gateway, the Dell Edge Gateway 5000 Series, we realized one of the biggest challenges to IoT project success is a cultural one. IoT is where the Information Technology (IT) organization and Operations Technology (OT) teams (think Engineering, Manufacturing and Facilities) have to bridge their differing business approaches to create a unifying platform for both sides. The OT organization is the one typically driving IoT initiatives. IT involvement is likely to evolve and grow over time, but they have concerns about technical fluidity, the lack of security and the inconsistent architecture. As we’ve worked alongside our partners and early adopters to develop the edge gateway, we learned that one of the useful roles we can take on for IoT is that of mediator between Operations and IT. To the IT side we want to say: IoT has put the IT into OT, so accept it as a new challenge and opportunity. For the OT folks: Adding an IP address to an OT device carries it into the oversight of the IT department, and it becomes a stakeholder. Working past the differences is useful, we believe, with enriching developments in store for those who make the strongest connections. What is an IoT gateway? Watch this 3-minute Dell video. In IT, the performance indicators are about security, governance, manageability, global deployments, governance and cost. OT is different; apps must just work, the access to data is needed 24×7, deployments must be quick, legacy system integration is often critical, and new business models must be accommodated. As the world of OT connects more and more data from what analysts say will soon be tens of billions of devices to the internet, OT personnel and IT personnel may sometimes feel like they’re in a collision course. Intelligent gateways need to have more than connectivity. A legacy router, as found in current IoT suites, is more of an appliance, passing through collected data to the cloud or a datacenter, and typically requires extensive ladder logic or other programming. In contrast, we envisioned an intelligent gateway that can be multi-function and easily extensible with modern, user-friendly applications that would make protocol translations and local IoT analytics more effective and achievable. And, unlike routers which just pass through TCP/IP data, a gateway can have much more diverse I/O, yet still be able to aggregate and normalize data from the various sensors, equipment and networks. In an area where global standards initiatives are just starting, interoperability is a good goal. An industrial-grade device that can withstand the rigors of factory floors, HVAC units, dairy farms, and more can sit at the edge of even challenging environments to bring power and flexibility to distributed IoT networks. The promise of IoT doesn’t motivate many companies with deep investments to toss out the old and start new. Nor should it. Building and factory automation industries have long histories with intelligent control systems. Our gateway approach is to enable IoT solutions that overlay on these existing systems, finding business benefit from leveraging the data already being generated and captured. The volume and complexity of data generated by the sensors, devices and equipment in the Internet of Things can overload traditional network infrastructure and data management and analysis tools. Not all the information generated is critical, and sending all data to the cloud or datacenter often uses up expensive bandwidth. Plus, in some cases, a real-time or near-real-time response is required, so latency is a problem as is being disconnected from the backend network. Placing an industrial-grade, intelligent gateway at the network edge allows it to integrate and normalize data from the sensors and act much like a spam-filter for the IoT network, passing only the meaningful data to the cloud, datacenter or control room. Here’s the result. 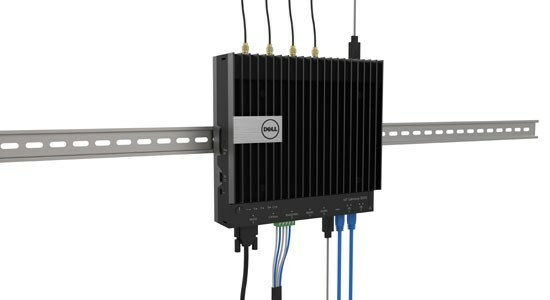 Our Dell Edge Gateway 5000 Series are intelligent, industrial-grade devices made to be mounted on walls or a DIN rail, with expanded I/O for commercial or industrial environments. They offer local analytics and other middleware to receive, aggregate, analyze and relay significant data to the cloud or datacenter for further analytics. 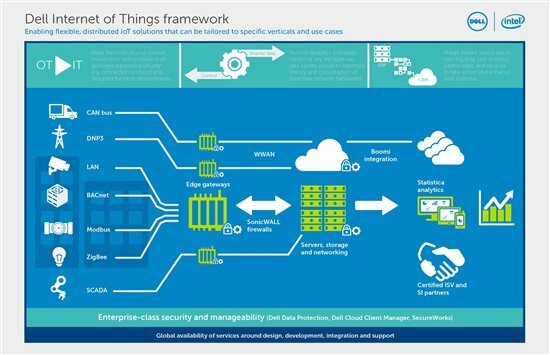 This series, designed to enable smart solutions for the building and factory automation industries, will be released to the market in mid-December and followed by additional Dell IoT gateways for other commercial IOT use cases, such as transportation and fleet logistics, throughout 2016 and on. As this blog post attests, much thought went into justifying the specifications of the Dell Edge Gateway. Specifically designed for original equipment manufacturers, an OEM-Ready version of the gateway is available, or we can draw upon Dell’s end-to-end solutions to enable a full IoT system for specific business use cases. One of our customers and channel partners is KMC Controls, a leader in building automation systems. This month, at its partner conference in San Antonio, the company announced the KMC Commander Internet of Things Platform for Building Automation, which is built on Dell’s Edge Gateway 5000 Series. Dell worked with KMC to launch this solution that helps building owners gain actionable data about their facilities like temperature and humidity trends, equipment run times and energy usage. KMC Commander is perfect example of solutions specialized enough for the data demands of OT yet seamlessly manageable in an IT environment. Plus, excitement over Dell’s solutions for IoT continues to build, as proven by the Linkedin articles, blog posts, and intriguing conversations, like a recent one with Fortune Magazine. We announced an IoT gateway contest, “Connect What Matters.” At Dell World, traffic was lively to the more than 15 different kiosks in the IoT Showcase with customers showing how Dell’s pragmatic approach is making IoT real today. The media seemed be enthusiastic about IoT at Dell as well, from Forbes talking about IT to Gary Mintchell’s Operations technology blog. Uniting the differing stakeholders will bring IoT to the market quicker, and we look forward to helping organizations find common ground.